Alveolar defect closure in cleft cases requires formidable efforts on the part of craniofacial team to restore arch continuity, stabilize the maxillary segments, establish bone support for the dentition and nasal alar cartilage, and obliterate oronasal fistulae and placement of dental implant. Bone grafting in large alveolar defects has shortcoming of high graft failure rate. In such cases, transport distraction osteogenesis is a procedure of choice to facilitate bone and soft-tissue formation by normal healing process. Bone transport in distraction osteogenesis employs osteotomy cuts in healthy bone, followed by bone-borne or tooth-borne distractor assisted movement of bone and teeth complex to close the cleft defect. However, the bone-borne distractor is more invasive and expensive. Hence, we employed a contemporary tooth-borne distractor, hyrax distractor tooth borne (HYDIS-TB) in our patients for its less invasiveness, and satisfactory result. This appliance is a custom-made tooth-borne distractor used for closure of large alveolar defects by transporting adjacent segments having teeth with associated bone with the help of a hyrax expansion screw. 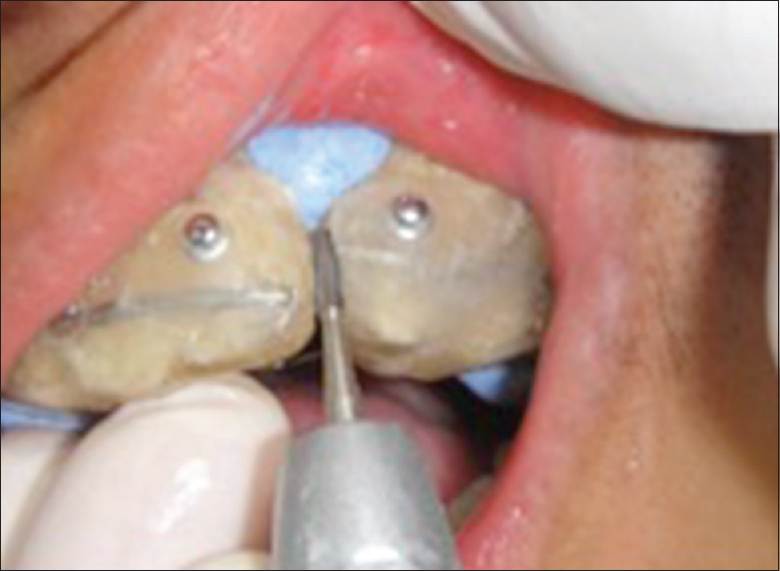 The screw is embedded in an acrylic capping over the teeth, and its activation moves the transport disc causing gradual reduction of the cleft defect. As the defect is narrowed, the intervening acrylic needs to be trimmed to allow closer approximation of docking segments [Figure 1]. During trimming, acrylic particles may be deposited at the site of distraction, thereby hampering healing process. The acrylic particles thus deposited act as foreign body and may cause inflammatory and wound infection. Hence, putty (Dentsply IH Ltd, Surrey, UK) was used as a blocking layer to protect these sites from trimmed acrylic dust. Putty is polyvinyl siloxane impression material commonly used for impression making in the oral cavity. It is available as separate base and catalyst which are mixed to allow addition reaction between the two, giving viscous, pliable consistency that can be molded in desired shape. After setting of putty material, the intervening acrylic was trimmed. This prevented the embedding of acrylic dust on the distracted area [Figure 3]. After trimming, the putty material was easily removed with the aid of an explorer. Distraction and docking sites were found to be clear of any acrylic particles [Figure 4]. During acrylic trimming by straight fissure bur, prevention of damage to intraoral tissue at the docking site is an additive benefit imparted by the putty material. The use of high-speed airotor can cause excessive vibration and break the cement seal securing the appliance. Hence, slow speed micromotor was used for trimming of acrylic with simultaneous irrigation and continuous suction. However, active irrigation alone could not have protected all the docking and distraction sites simultaneously. Thus, it was planned to use putty material to cover all the three sites. Furthermore, precaution should be taken to avoid mixing putty material with gloved hands because powder in the gloves interferes with setting of putty material. 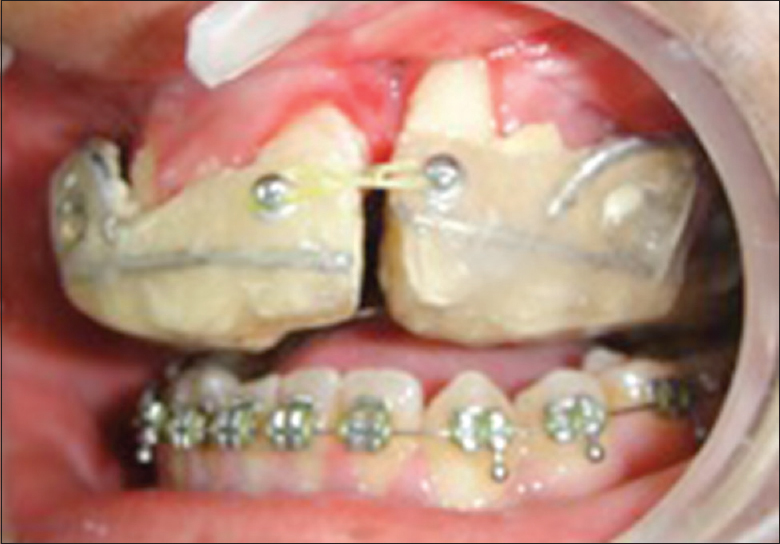 HYDIS-TB is a successful appliance for the closure of large alveolar cleft defect. The use of putty material at the surgical site facilitates normal healing by preventing infection at the surgical site. Thus, this modification acts as an adjunct to the present HYDIS-TB appliance to enhance its usefulness. Peamkaroonrath C, Godfrey K, Chatrchaiwiwatana S. New clinical method for alveolar bone graft evaluation in cleft patients: A pilot study. Cleft Palate Craniofac J 2011;48:286-92. Neha, Tripathi T, Mohanty S, Rai P. A novel minimally invasive technique of using tooth-borne hyrax expansion screw for distraction osteogenesis of large alveolar cleft defects (HYDIS-TB). Cleft Palate Craniofac J 2018;55:895-902. Hegab AF. Closure of the alveolar cleft by bone segment transport using an intraoral tooth-borne custom-made distraction device. 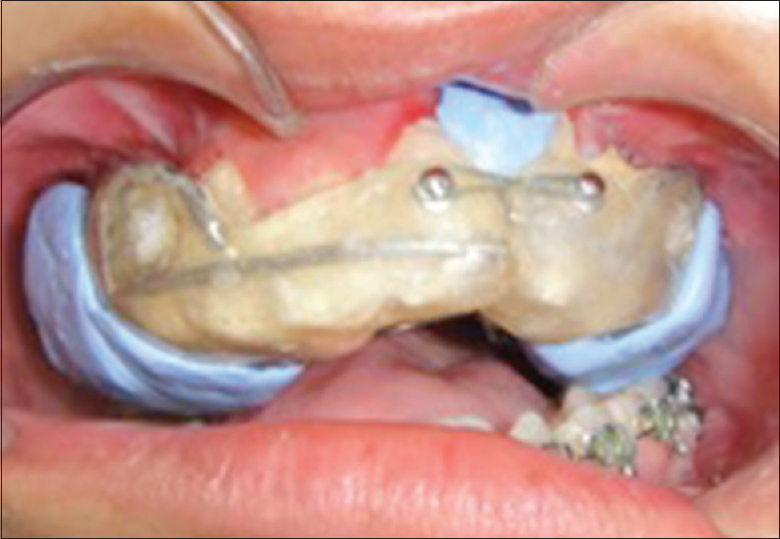 J Oral Maxillofac Surg 2012;70:e337-48. Ho W, Lai PC, Walters JD. 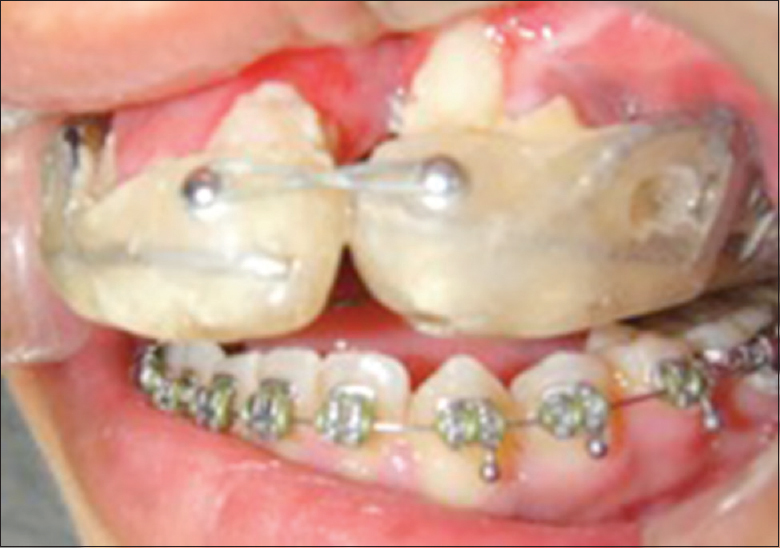 Chronic swelling from entrapment of acrylic resin in a surgical extraction site. Contemp Clin Dent 2010;1:193-5. Chee WW, Donovan TE. Polyvinyl siloxane impression materials: A review of properties and techniques. J Prosthet Dent 1992;68:728-32. Politis C, Schoenaers J, Jacobs R, Agbaje JO. Wound healing problems in the mouth. Front Physiol 2016;7:507.